As someone who manages music projects, it’s your responsibility to help your team get the best results. People look to you to make sure there’s no one dropping the ball and that each project is finished successfully. Bounce Boss keeps you informed with which collaborators are up to date with their notifications and which collaborators have yet to see the latest comments and files. In the collaborator’s section of the main player page, you’ll see the notification counters. You can click on any collaborators notification counter to see what they’ve missed. 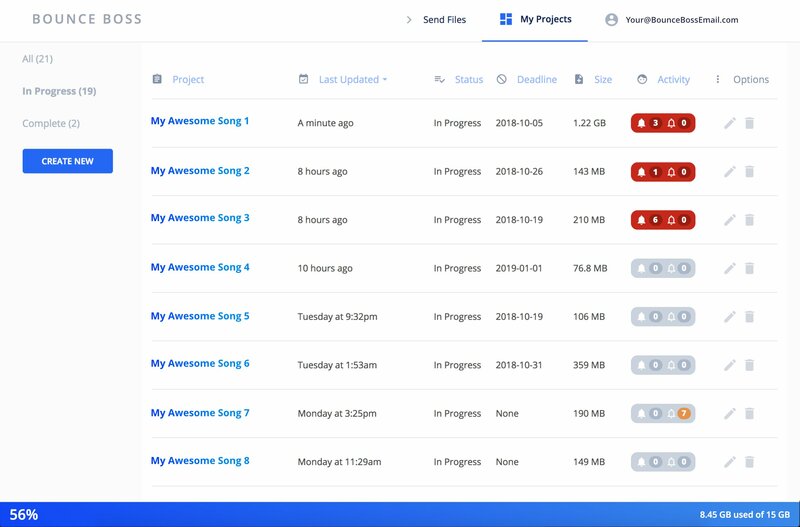 You will probably find that Bounce Boss encourages your collaborators to stay up to date with the project’s progress, meaning the notification count should be zero more often than not. As a manager, wouldn’t you agree that good organization leads to fewer mistakes and less wasted time? The knock on effect of good organization is that you’re able to complete more projects improving your chances of being successful. When someone sends you files, give them your “Client Invite To Project’ link. This will give them a simple to use upload page that will make sure every project that lands in your inbox is organized. You can make anyone effortlessly organized with Bounce Boss. The ‘My Projects’ page makes meeting deadlines the easiest part of your process. Even if you have 100 projects you could quickly preview which projects require your attention and which projects require the attention of your collaborators. The activity counter shows your unseen notifications on the left and your collaborator’s unseen notifications on the right. You can order the projects by the deadline to make sure you always deliver on time. Or order projects by size to see which ones are taking up the most space. Your reliability builds customers loyalty and keeps you in their mind as their go-to professional. The real-time chat window in Bounce Boss gives you tools to communicate in a very precise way. You can click and drag on the waveform to create a loop, then add a comment that specifically relates to your selection. 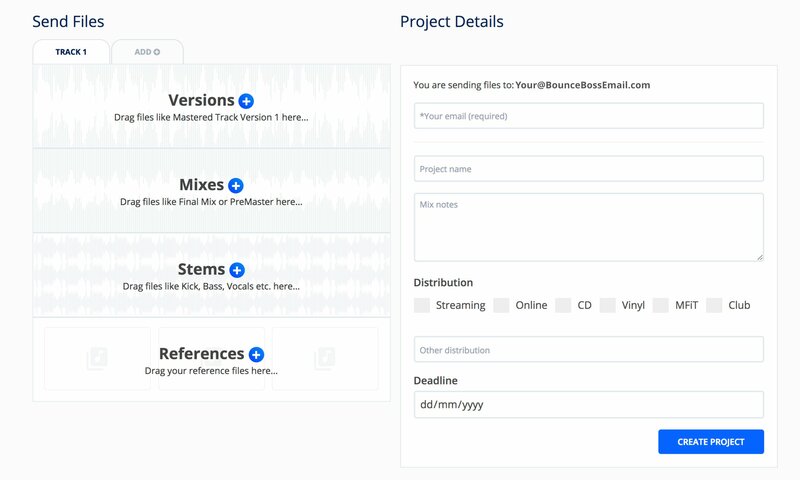 Your collaborators will see the link in your comment and be able to immediately preview the part of the track your comment referred to as they’re reading your feedback. With Bounce Boss there will be less chance for confusion about what you’ve said.